If you want to use Sleeknote after your free trial has expired, you'll need a subscription. 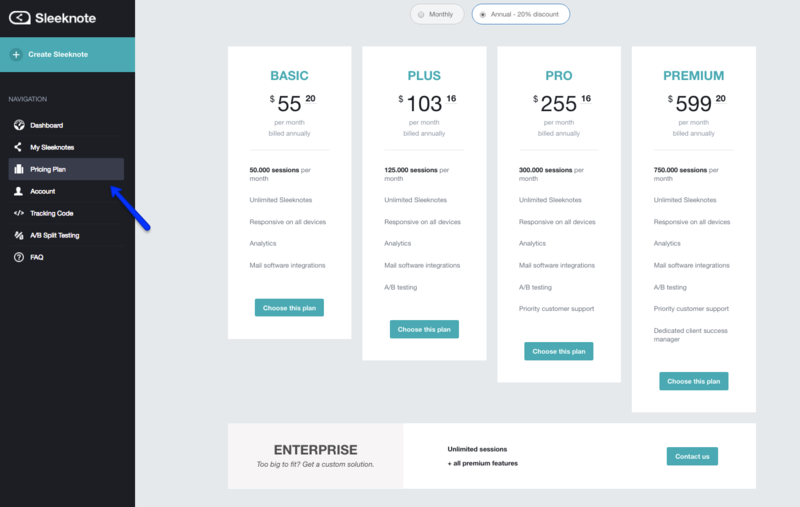 When logging in to your dashboard, you'll find an overview of our pricing plans in the menu to the left. Basically, the amount of monthly sessions on your page determines, which subscription you should settle for. When you've found a subscription that fits you, there are two options of either choosing a monthly or an annual subscription. An annual subscription might also be an excellent option, if you find that the amount of sessions on you website differs from month to month. Hence, when you add an annual subscription, you'll have access to all sessions at once, which gives you the opportunity of distributing the sessions depending on the amount of sessions you have from one month to another. If you need help finding the right subscription, please get in touch with us, so that we can find a convenient solution for you. The only thing we require is information about your traffic, i.e. the amount of sessions you have. Do note that when cancelling your subscription, your account will be deactivated and your sleeknotes will no longer display on your website. If, at some point, you want to start using Sleeknote again, just let us know, then we'll make sure to activate your account again.